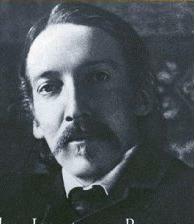 Scottish writer Robert Louis Stevenson (1850-1894) is, for many of us, the first poet to whom we were introduced, through his wonderful book, A Child’s Garden of Verses. Though he came from a family of engineers and it was expected he would follow suit, Robert wrote stories even as a child; no one was really surprised when, three years into his engineering studies at the University of Edinburgh, he abandoned them to study writing. Always an avid traveller, despite lifelong poor health, Robert spent much of his life looking for a place to live that offered some respite from his illnesses. A prolific writer of poetry, fiction (Kidnapped, Treasure Island, and The Strange Case of Dr. Jekyll and Mr. Hide are his best known), travelogues, and political essays, he is properly revered today as a major literary figure, although in the early twentieth century, he was temporarily dismissed and disdained as "a children's author." Ultimately, Robert ending up living in Samoa, happy and productive until a stroke abruptly ended his life at the age of 44. What a pure joy! Thanks RLS & Jayne! And we must remove snow drifts this pink morning. love this. esp. the imagery in the last two lines! Our regular bedtime story read to my sister & me, when very young, was a selection from 'A Child's Garden of Verses' but unfortunately never heard this one. This covers the whole winter scene! My brother often said "A lot of frosty pepper today!" - now I know where he got it from! Loved the poem. When we bought our Canadian farm (My parents had had one in Wales, before I was born) we found an old sled in one of the barns. There being no reindeer available, we hitched it up to a horse. Oh, the bone-shaking! Kudos to the inventor of the pneumatic tire! -dlj.